After thousands of years we are still amazed at the grandeur and design of ancient Egyptian architecture. Not only did the Egyptians construct the largest stone building in the world, the Great Pyramid, but they also built the Karnak Temple which was the largest place of worship. The Karnak Temple received additions from over 20 pharaohs until it was over 600 acres in size. The ancient Egyptians introduced us to several new architectural ideas including columns, pylons, the cavetto cornice, torus molding, and the kheker frieze. Architecture would reach its pinnacle during the prosperous Egyptian New Kingdom period (1567-1085 B.C.). it was during this time period that the Egyptian pharaohs constructed large tombs in the Valley of the Kings. At this time bigger was better as the kings constructed larger and larger monuments. In 1503 B.C., Queen Hatsheput started construction on what would become an incredible temple in Thebes. Then in 1318 B.C., King Sethos I, undertook a major building campaign. He constructed the largest tomb in the Valley of the Kings. Ramses II built enormous buildings throughout Kush-Nubia and Egypt. He constructed the gigantic Great Temple in Abu Simbel. It was a gargantuan 65 feet high and weighed 1,100 tons. Because the Egyptian hot Sahara desert does not hold its heat, temperatures can reach 120 degrees during the day while dropping to almost freezing at night. The Egyptians developed a housing design that became the solution for these extreme temperatures. They constructed adobe brick rectangular homes that pointed to the north, taking advantage of the prevailing breeze. The family living quarters could be sealed for warmth when it became cold. 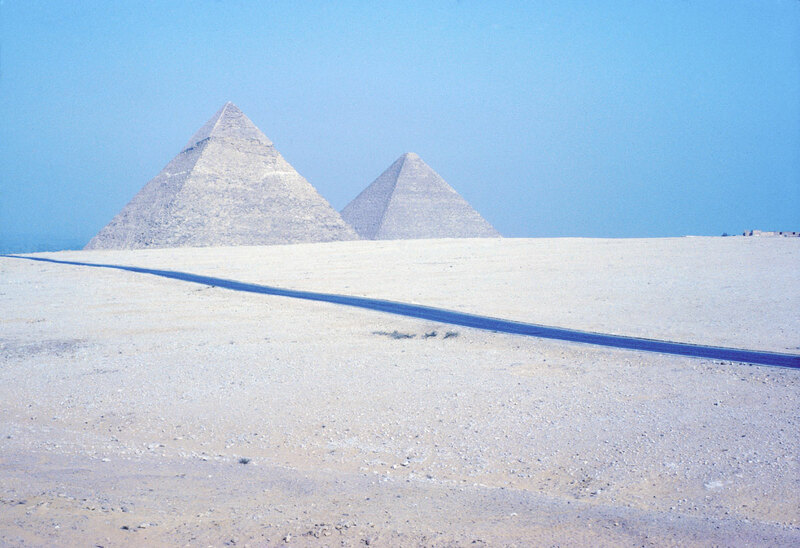 The Egyptians placed their windows close to the ceiling so that the hot air would leave. Egypt did not have a national or royal palace, but instead each pharaoh constructed adobe palaces in the cities where he planned to live. Almost every pharaoh had a palace in Thebes and Memphis. None of these palaces have survived because the mud brick eroded over time. The best example of an ancient Egyptian palace was Amenhotep III's palace. His palace was an enormous 1,000 ft. by 1,500 compound. It had amazing gardens, and an artificial lake that was 2 miles around. Temples and permanent buildings were made of stone. As the Egyptians became more prosperous they opened new quarries so that they could build more and more temples and other permanent structures. Egyptian forts could be either very small or entire fortified cities. The Egyptians had fought for centuries against the fortifications of the Middle East so they knew which design features worked the best. Walls were 30 ft deep and designed to stop battering rams, and the forts were surrounded by 15 ft wide moats that were 5 ft. deep. Preservation of the body for the afterlife was very important to the ancient Egyptians. They placed the graves inside a rectangular solid structured container called a mastabas. In 2,700 B.C., a pharaoh named Zoser stacked six masabas on top of each other that resembled a tiered wedding cake. It was 200 ft high and today is called the Step Pyramid. This was followed by the pharaoh Huni who stacked them 300 ft. high and filled the steps with stones and smoothed the sides in plaster. Huni's structure eventually became what is considered the first Egyptian pyramid.